1. Elijah John Ricker m. 2. Charlotte Elizabeth Lamb in Greeneville, TN. They had nine children. 3. Uriah M. Ricker was their fourth child. 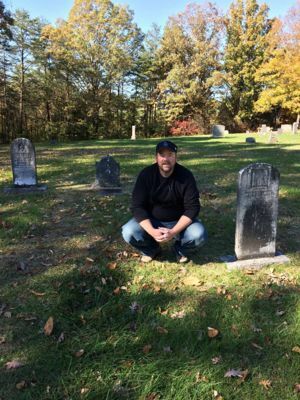 Michael marking the possible grave location of Uriah M. Ricker. His wife, Martha Smith’s grave is marked adjacent. My new goal will be to post 3 Ancestors every 3 weeks. I will be looking at a family unit, two parents and a child. These will be my 3rd Great Grandparents and their child, my 2nd Great Grandparents. My life cycle at home is constantly changing but I think I can work within a three-week cycle and still have the flexibility to handle the constant change at home. It feels like the right decision but only time will tell. I am following the Ahnentafel for my challenge. However, I am not using that numbering system. Rather, I will number my ancestors in the order of the weeks they represent. I will be posting about my 3rd Great Grandparents and their child, a 2nd Great Grandparent, in these posts. If I used the Ahnen Numbering system, this weeks ancestors would be numbers 32, 33 and 16. You can see this system as presented by WikiTree on the Ancestor List page. Uriah M. Ricker is number 16 and his parents are numbers 32 and 33 respectively. One interesting thing about this system is that even numbers are always male and odd numbers are always female. Now, you will notice that I am starting with Elijah John Ricker and son Uriah M. Ricker. These ancestors position in my tree would typically indicate that my surname would be Ricker, not Stills. You will notice that Uriah’s only son is Smith Alexander Stills, my first Great Grandfather. This is because I believe that Smith’s parents are not William Henry Stills and his wife Nancy Tarlton. Smith’s parentage is in question and it looks like I will need DNA testing to confirm my hypothesis. Determining Smiths parentage is very complex as there is no direct evidence. But that is a story for a future post. In order to take advantage of Y-DNA testing, I will need to find other Rickers to compare my Y-DNA against. That means I need to have my Stills/Ricker paternal line well documented. As of this writing, it is not. Robert Charles Anderson’s concept of Genealogical Defined profiles is an excellent tool to help you examine your ancestors to discover what evidence you may have or need to obtain. This knowledge will help you determine which research strategies you need to develop to get your answers. For each profile we will look at evidence for Birth and Death dates and locations (Vitals), evidence for parents, spouse(s), and children. Vitals: Census Records appear to be the only source for his birth. His death is estimated based on his marriage to his first wife, 14 Feb 1887 and her marriage to her second husband, James Marshall on 28 Jun 1891 and because he does not show up in the 1900 Census. Unfortunately we do not have the 1890 Census to examine. Parents: The 1860 and 1870 US Census puts him in the household of Elijah and Charlotte. However, it would be nice to find a birth or baptismal record. Spouse(s): Uriah appears to have been married twice, first to Martha M. Smith and second to Hester E. Seaton. Marriage records have been found for both. A Will would be helpful but none has been found. Children: Uriah appears to have only one child, Smith A. Stills. This is only evidence for this relationship comes from the 1880 US Census that shows Uriah, his wife Martha Smith and their child Smith A. as a family unit. Family stories suggest his parents where killed in an accident but do not give the names of his parents. We do know, however, that Smith was raised by William and Nancy (Tarlton) Stills. Vitals: Birth is estimated on the 1850 Census and secondarily from his death record. Nothing substantial has been found. His death comes from his tombstone and the fact that he does not appear in the 1880 Census with his wife Charlotte who is recorded as Widowed. The search for a better birth and death record continues. Parents: Only the 1850 US Census puts him in the house of John K. Ricker and Mary Delilah Lyles. While Ricker tradition holds this to be correct, better evidence is needed and may possibly be found in the Will of John K. Ricker if one is found. Ideally we would have a church record but none appears to have been found. Spouse(s): Marriage records provide evidence for his wife Charlotte Elizabeth Lamb in 1843. He is found living with Charlotte in the 1850, 1860, and 1870 US Census. Children: A will has been found and needs to be reviewed. The US Census records give us information for many of his children. Examination of each of his children may turn up further evidence of his relationship to them. Vitals: While an exact date for the birth of Charlotte has been given, it is uncertain where this information is documented. Marshall Styles in his work, “Marmaduke Lamb & Wife Orpha Rollins of Greene County, Tennessee.” Provides this date but his work needs to be examined closely to find the source material where this date comes from. Her death comes from a Findagrave record and similarly, better documentation needs to be found. Parents: Charlotte is found living with Marmaduke Lamb in the 1850 Census. There may be a will for Marmaduke that would help establish her connection. Children: No Will for Charlotte has been found. Eljiah has a Will that needs to be examined and many of her children are listed in the 1860 – 1880 US Census. This has been a quick review to help me identify what I know and what I may need to research further. It his by no means exhaustive, but using the Genealogically Defined concept can help you pinpoint the types of records you need to go looking for. These were some of the very first ancestors I found, long before I gained an appreciation for evidenced based research. It is proving very useful to review these with fresh eyes and new research strategies. I will send them along. I have also posted to mitoyDNA.org which is in the process of developing a database to enable Y-DNA and mtDNA matching. https://mitoydna.org/.